My patient teacher David Tousek helped me quite a bit with the hair, the UV maps, the lights, setting up the shot etc. Thanks Dave! Can’t wait to learn how to animate the little bugger (Super Lego Man, not David). 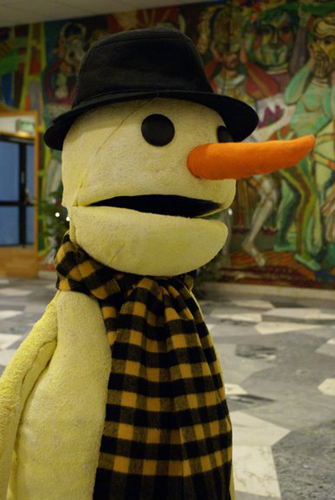 Puppet Snowman – the video! Here’s the video!. It was shot from the back of the auditorium with a simple digital camera, so don’t expect any high defintion extreme close ups. It’s still a little bit out of synch – I tried my best – but it’ll do for now. Unfortunately for my English blog-readers the sketch is in Swedish, but it’s just a bunch of lousy jokes on the word “snow” anyway, so you can probably follow. Enjoy! 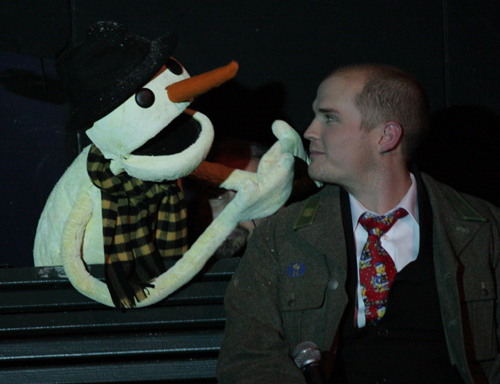 14 Dec 2008 I made one of my rare puppet performances at Bobbe Big Band’s christmas concert. 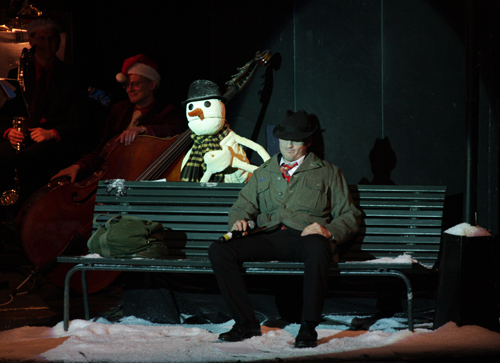 It was a sketch featuring Carl-Johan Lennartsson, one of the song soloists, and a snowman. Tadaa! Photo by Tobias Lennartsson. Photo by Christian Berling. 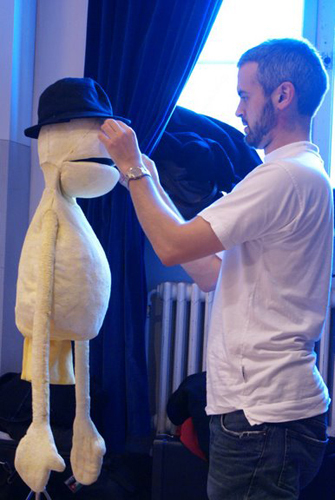 During the performance Christian’s excellent lightning whitened the snowman even further. There is a video recording of the sketch, but the sound is out of synch. As soon as I’ve fixed this problem I’ll post the video on Youtube. I have a German fan! His name is Hans. He’s a 59 year old chef. His wife Ulrike collects “pig-tures”, cartoon pigs made by comic artists from around the world. He sent me a long very kind and sweet e-mail asking me to draw a pig for his wife. This is so far out it could be someone pulling my leg (Jimmy, is this one of your practical jokes?). If so, it was so well done that I’m happy to fall for it. Here’s an Elvis pig for Ulrike! Regardless if Hans and Ulrike are for real, I’ve been wanting to find a technique suitable to make “luxury cartoons” if the occasion should arise. So I used this fine request to try some stuff out. Which one of the pigs do YOU prefer? 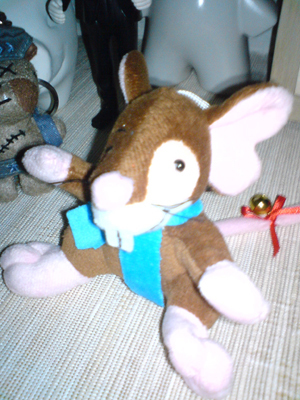 My first piece of merchandise ever: It’s Pling, the mouse from the recently released comic booklet TanimaL! 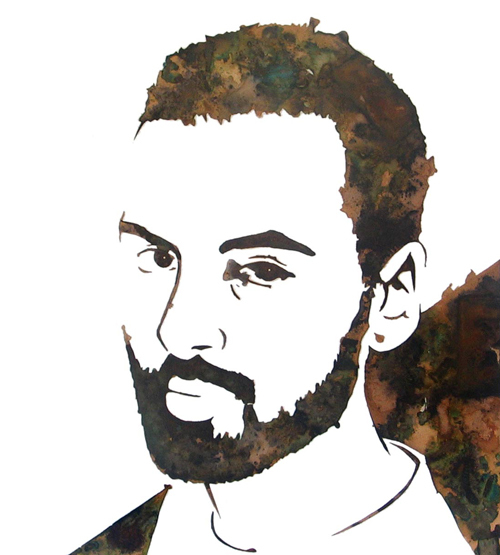 He turned out much better than I expected actually. They said he’d be a “beanie bag”, so I pictured some sort of baggy unshapely thing, but this is actually quite like the cartoon. I always dreamed of having 3D merchandise versions of my characters. Maybe not mice. Maybe more kind of action figure characters. But anyhow, this is not a bad start. I hope Abigail – who made the original drawing – is as happy with Pling the Toy as I am. Here he is with the rest of the family: Mubarak, Dark Dude, The Thumb and Sir Edgar Alan Poe. Final Kickstarter Update: What is The Pacifiers?